At the National Constitution Center in Philadelphia Thursday, the national anti-death penalty organization Witness to Innocence calls for Pennsylvania to abolish the death penalty. The nonprofit used the event to highlight its 15 years of activism, which supporters credit with playing a “decisive role” in campaigns that abolished capital punishment in seven states — New York, New Jersey, New Mexico, Illinois, Connecticut, Maryland and Nebraska. “It’s the power of story that changes hearts. You cannot look into the eyes of someone that’s been sentenced to death and not feel it,” said Kathleen Lucas, executive director of Pennsylvanians for Alternatives to the Death Penalty, during the event at the National Constitution Center. Derrick Jamison, one of 21 former death row inmates and WTI members in the audience, shared his story. In 1985, an Ohio judge sentenced Jamison to death after he was convicted of armed robbery and aggravated murder for beating a bartender to death in Cincinnati. The 57 year-old was exonerated and released exactly 20 years later after he was granted a new trial. A federal judge found that prosecutors withheld key evidence, including witness testimony from a handful of people who were with Jamison at his girlfriend’s home during the robbery. “I got the worst case in American history,” said Jamison, who believes 35 pieces of evidence proving his innocence never made it into the courtroom. Jamison may be free, but he will never be able to shake the trauma of sitting on death row for nearly two decades. He was scheduled to be executed six times during that span, but always got a stay from the governor. “The death penalty is cruel and unusual punishment and shouldn’t nobody be allowed to say who lives or dies in America,” he said. It was a sentiment echoed throughout the event, which also included famed advocate Sister Helen Prejean, as well as attorneys — such as Philadelphia District Attorney Larry Krasner — who have made it their life’s work to fight against the death penalty. 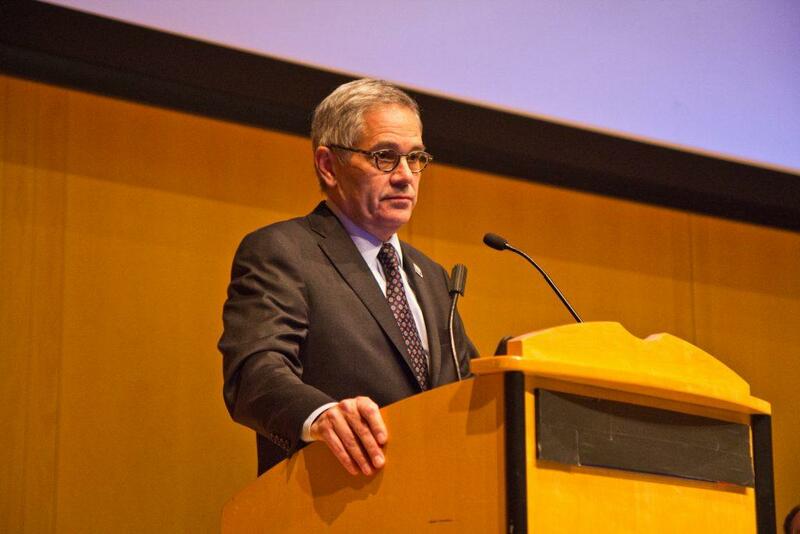 Krasner, a former public defender and defense attorney who has represented clients in capital cases,was praised by nearly every speaker on stage. On Thursday, he told the crowd his time as a juror on a capital case in Chester County helped shape his beliefs. He was 23 and applying to law school. Krasner and his fellow jurors convicted a man of first-degree murder, but the case never reached the death penalty phase. A juror was removed from the panel during deliberations because of his “psychotic” behavior. “The defense attorney did about the only good thing that he did with that case, which is he cut a deal, that a verdict of 11 would mean no possibility of a death penalty phase and no possibility for a death sentence,” said Krasner. “I was profoundly affected by that. I was profoundly affected, in some ways, by the strength, but in many ways, the frailty of our justice system,” he said. Larry Krasner, Philadelphia's district attorney, speaks at the National Constitution Center Thursday. During his 2017 campaign, Krasner, who’s progressive approach has grabbed national headlines, said he would never seek the death penalty. As district attorney, though, he hasn’t taken it completely off the table. In June, brothers Carlton Hipps and Ramone Williams accepted a plea deal that spared them the death penalty for killing Sgt. Robert Wilson III during a robbery in North Philadelphia in 2015. Instead, Hipps and Williams will serve life without parole, plus 50 to 100 years in prison, a decision that upset Wilson’s family and friends. “They call this death by incarceration. I call it justice deferred,” said Officer Michael Rivera, who went through the police academy with Wilson, after the sentencing. Since 1978, 201 defendants have gotten the death penalty. Only one has been executed. “If you’re talking about efficiency, that’s not it,” said Robert Dunham, executive director of the Death Penalty Information Center. Pennsylvania hasn’t executed an inmate on death row since 1999. In 2015, after being elected to his first term in office, Gov. Tom Wolf imposed a moratorium on executions. After Wolf easily earned another term, that moratorium is likely to stand for at least the next four years, though last month’s mass shooting at Tree of Life Synagogue in Pittsburgh could push the issue. Federal prosecutors on the case, considered the deadliest anti-Semitic attack in American history, are pursuing the death penalty for Robert Bowers, who is charged with gunning down 11 congregants and injuring six more during a Saturday morning service.